Hello, students of the best school ever. 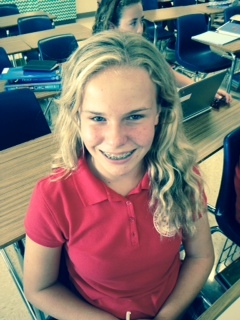 This is the profile of Brianna Bolin an eighth grade writer here at the falcon flyer. She likes to read, hang out with friends, watch television, and of course write, here on the flyer. Brianna has been writing on the falcon flyer for a year and is psyched to continue writing in her eighth grade year. Her favorite color is light blue, her fav. animal is a bunny and adores polka dots, she also loves: foreign foods(especially Chinese), nail polish, and her iTtouch. Her favorite class is Social Studies and hopes that this is an awesome year for everyone this year.